Hi, I'm a football fan living in Portugal. I'm writing a book on British managers in Portugal. One of the first was Bob Kelly, prior to signing for Burnley fc in 1913 he was a coal miner. I'm trying to find out which colliery, and for how long. I wondered if you didn't know could you point me in the direction of someone who might? I would appreciate any help you can give me in this matter. Also Bob went down the mine straight from school so I believe. I'm not sure what the school leaving age was back then, was there a minimum age to work at a pit? Did they have to work on the surface first for a while before going underground? There were lots of pits around Ashton in Makerfield and many more surrounding a few miles distant. It was not unusual for a man to walk several miles each way to work at a certain mine albeit that he may have passed 2 or 3 on the way. I suppose it was preference. Maybe a friend or relative worked there etc. It is impossible to say without some written evidence. In 1867 there were 13 collieries in the district of Ashton-in-Makerfield. Others followed including Brynn Hall Colliery, owned by Edward Frederick Crippin, the Mains and Park Lane Collieries. Park Colliery and some of those open in 1867 (e.g. Garswood Hall) remained productive until the 1950s. Joe Gormley, President of the National Union of Mineworkers in the 1970s and 1980s. The Education Act of 1936 raised the school leaving age to 14. Boys of 14 were allowed underground and trained on the job by the relevant private colliery company. In 1944 the school leaving age was raised to 15. The first Training Centre was at Creswell. This centre was used also by Bevin Boys 1944 to 1946. After 1st January 1947 under NCB any boy over 15 and up to 18 had to have 16 weeks underground training at new local Training Centres......Bentinck, Silverhill, Williamthorpe, Mansfield, Hucknall, Bestwood etc. Following this 20 days CPS (close personal supervision) on the allocated job was required. For lads over 18 years old only 3 weeks training was required. I’ve had a very enjoyable fly around your website (thank you) – my Grandpa worked at Swanwick Pit all his working life and even after his retirement he used to walk to the site and follow its decommissioning progress – I can recall walking over to the site on many Sunday afternoons, getting very black! I’d love to know if you have any employment history for him? and or any more photographs of the pit and workers? Sincere best wishes, and thank you for the website. I have just found your site. I'm afraid I don't know if you are still managing it actively but a lot of fine work has obviously been put into it. "Mr A. Crawford, J.P. Former chairman of Bestwood Company. The death occurred yesterday of Mr Andrew Crawford, J.P., of Manor Park, Ruddington, in his 94th year. He was formerly chairman and managing director of the Bestwood Coal and Iron Company. Mr Crawford was born in the West of Scotland and came to Bestwood in 1882, joining the company of which he became the head. He was connected with coal, iron and steel all his life, and in 1908, with members of the Lloyd family, built the first blast furnaces at Corby, Northants. Mr Crawford was also a director of a number of other companies connected with the industry. He retired 13 years ago, and continued to enjoy good health up to six months ago. A keen sportsman, he was one of the earliest lawn tennis players in this area and was also interested in cricket. He had also played golf, and was a member of the Notts Golf Club. Gardening was his principal hobby and he made a speciality of roses. Mr Crawford resided at Bestwood until nine years ago and then moved to Ruddington. He leaves two sons and six daughters. Mrs Crawford predeceased him six years ago, after 67 years of married life"
Are you able to throw any light on this at all? Is the obituary inaccurate do you think? I am reasonably certain that he worked there in a senior position during the 1900s. You are correct in assuming that Andrew Crawford was indeed a Director of the Bestwood Coal Co Ltd (Bestwood Coal & Iron Co Ltd). I have not gone into much detail regarding directors in my work and some are only mentioned when regarding certain things of what I thought was important at the time. 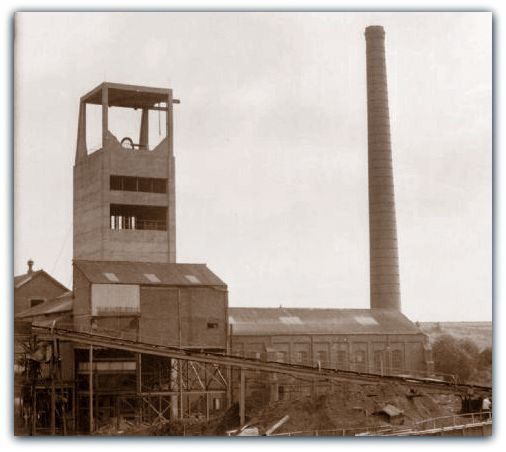 I write a condensed resumé of the life of a colliery when it closes as you see, showing management personnel, tonnages etc, but many remarks not necessarily in that are to be found in the years from the sinking of Bestwood in 1872 onwards to 1967. There are many directors throughout the coalfields prior to nationalisation 1 Jan 1947 and it will be seen in the books that some men were directors on several coal company boards, even those in competition! BA Collieries Ltd was created on 1 April 1936 by the amalgamation of Bestwood Coal & Iron Co Ltd and the Nottinghamshire pits of Babbington Coal Co, plus the addition of the Digby Coal Co on 1 April 1937. The site is being continually added to and amended, and my contribution is up to 1987 (66 per cent). A fair way to go yet to complete. Also many more photographs to illustrate will be inserted as time allows. There is some additional information on google. Part, Dealtry C., Col., O.B.E. Seely, Charles H., Sir, Bart. General Manager: Hepplewhite, R. H. F.
I’m hoping you can help me. My Grandfather was a miner at either the Worksop Colliery or the Warsop Colliery, but I don’t know which. Do lists of employees. Still exist for the Worksop Colliery? There is a family story relating to the above that he struck a drunken miner who was assaulting another miner. The blow resulted in the man dying. This was an incident above ground – allegedly because the victim was refused permission to work because of his inebriated state. He was not charged, since the man’s mother spoke in defence of Job. Hi there Frank Moore here. My son showed me the site excellent. Just coming up to my 90th birthday here and there is a correction needed. You have me as Under Manager at Denby dated 1957 but this should be 1967/68. In 1957 I was at Woodside as Under Manager! Sam Greaves was at Denby Drury Lowe until 1967 not 1968 as I took over from him in '67 and he went to Denby Hall. They were merged but operated as two separate pits and management structures. I then went on to Ormonde from '68 then onto Warsop. My name is Charlotte Davies, for the past couple of years I have being trying to trace my family tree and since finding out that I had relatives that died in the Whitwick Colliery Disaster in 1898 I have being trying to find as much information as possible about them. I found your website and was fascinated to find that you have a section about my great-grandfather James Edward Davies. Notes:	A fire broke cut on the main airway of the mine and developed rapidly that only six men including the deputy out of a total of 41 who were at work beyond the fire were able to escape. The bodies of the first nine mentioned in the list were shortly afterwards got out but 25 bodies had not been recovered by the end of the year. 35 killed. The photo by the way is not Jim Davies, although he used to dress like that. I remember him well. The person in the photo was an Overman Walter Flint at Ollerton.